Happy Monday! I took a blogging holiday yesterday and enjoyed a fun filled day with the family. Usually Sundays are my blogging days, but I was just enjoying the last day of the weekend! Tapering has given me a lot of extra time to actually rest and enjoy a weekend VS worrying about getting a run in or being overly tired from high mileage runs. So this week’s fitness and meal plan is set! I have only one run on Wednesday of any sort of mileage, 4 miles with 3 at race pace. Other than that, I’ll be running just a mile a day to keep my streak going! Sunday is the big day!! City of Oaks Marathon Ready! Meals are a little all over the place. We are cooking spaghetti and meatballs tonight but the rest of the week hasn’t been figured out just yet. I am trying to eat what I crave in hopes that I pre-carb and protein what my body wants/needs. We’ll see! 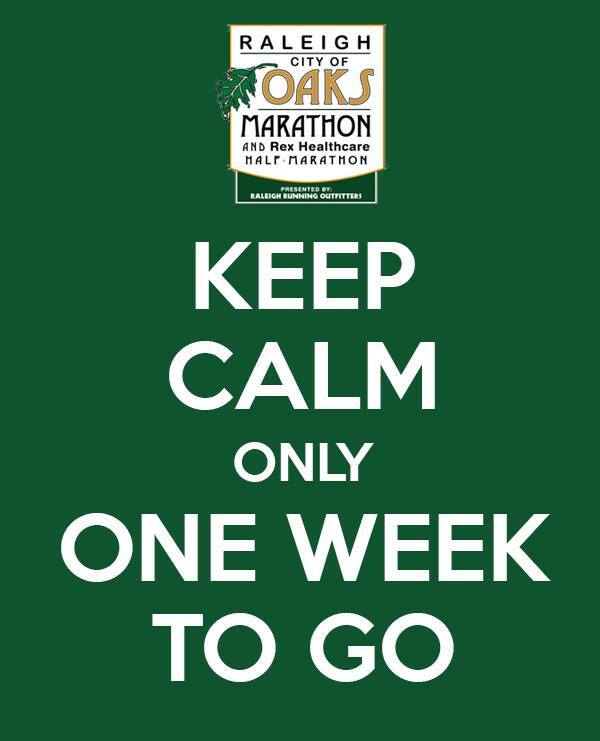 Marathon Training: 17 weeks, 1 week to go! This week’s training runs when off super easy and well! I had one last 5 mile tempo on Wednesday, which I ran conservatively quick, which worked out great! I kept a good pace that felt like I was pushing, but could hold it just the same. I think the cooler weather made a HUGE difference. For Saturday’s long run, I kept it as close to race pace and paid attention to my HR at the same time. We ran a few hilly routes and I was still within 10 seconds of my intended race pace, which is reassuring! The full I’m running is a bit hilly and I hoped my pace wouldn’t suffer to bad if I stuck with my HR plan. Thank you!! I’m excited and nervous at the same time!